Typhoon Haiyan swept across an area roughly the size of Portugal in the central Philippines that yields two rice harvests a year, in March/April and October/November, and provides upwards of a quarter of the country’s total rice production, a staple part of the Philippine diet. The UN Office for the Coordination of Humanitarian Affairs (OCHA) says 77 percent of farmers have lost their main source of income, while the Department of Agriculture estimates that more than 850,000 people working in the agriculture sector, many of them subsistence rice farmers, have been affected. Armando Alimangohan, 51, saw his 1.3 hectare paddy field destroyed on 8 November and knows all too well the impact of the typhoon on his livelihood. “We’re completely dependent on farming. We’ve lost everything and now don’t even have seeds to plant,” he said outside his home in Alang-Alang, a largely agricultural community of more than 45,000 residents in the central Philippine province of Leyte. “The impact was devastating,” Antonio Gerundio, regional executive director for Region VIII, one of three regions impacted by the storm, told IRIN in the badly affected city of Tacloban. The region has six provinces - Leyte, Southern Leyte, Biliran, Northern Samar, Samar and Eastern Samar - where more than 45,000 rice farmers have been affected. “Many of the farmers have been wiped out. Not only have they lost their homes, they have lost their homes and rice crops, but also their tools and equipment, as well as what rice they might have had in storage from the previous harvest,” Gerundio said. Region VIII produces almost 1 million metric tonnes of rice annually, making it one of the top five producing regions in the country, with each farmer having a field of 0.8 hectares on average. Upwards of 95 percent of the region’s 38,400 hectares of standing rice crops were also destroyed, enough to produce 170,000 metric tonnes of rice. “We provide 6 to 8 percent of the country’s rice supply,” Gerundio said. “Relief and rehabilitation for these farmers will be critical.” This is echoed by the Multi-Cluster/Sector Rapid Assessment (MIRA), a cooperative effort involving more than 40 agencies across nine provinces, which was released on 28 November. If farmers are unable to plant now, they will have no harvest in March/April 2014. They would have to wait for the next planting season a couple of months after that and wouldn’t see a harvest until October 2014. “That means from today until next year they would have to rely on emergency assistance,” Vinet said. According to FAO, one bag of seed is enough to plant one hectare, which will feed a family of five for one year, while leaving them with some extra to sell into the market. FAO has secured enough rice seed for 15,000 farming families, and enough corn seed for thousands more. The Philippine Government has requested FAO’s assistance in procuring another 640 MT of rice seeds, in addition to its own seed stocks. But that will prove a challenge. 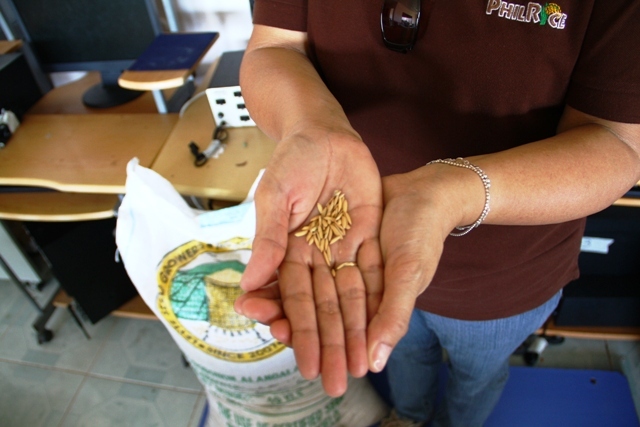 FAO is only procuring seed that meets government certification, and with ongoing assessments, the actual amount of seed needed could ultimately prove much more. ”The gap is getting wider,” Vinet noted. The next harvest occurs during the country's annual dry season, but depending on the region, the dry season varies from January to June in the affected areas, except for Region VIII, which will enjoy rain until March 2014. In general the rainy season in the Philippines lasts from November to June. “Not only do we need to help farmers plant, we need to help them clear their land and restore the irrigation system, much of which was damaged or destroyed in the storm,” Vinet said. On 27 November, FAO called upon donors to provide more than US$11 million to get money to rural people to help clean and clear agricultural land and de-silt irrigation canals in the aftermath of the flooding caused by the typhoon. This is in addition to the $20 million already requested by the agency to help typhoon-affected farmers plant, fertilize, irrigate and maintain their crops, to ensure the next harvests in 2014.